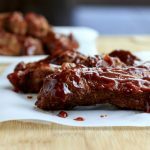 Keto Instant Pot Country Style Ribs are simple to make, low carb, paleo and gluten-free. Includes video instructions. In a small saucepan over medium heat add butter and melt. Add tomato sauce, apple cider vinegar, liquid smoke, Worcestershire sauce, molasses, erythritol sweetener, 1 tsp garlic powder, ½ tsp sea salt, and ½ tsp onion powder. Stir until blended. Remove from heat and set the barbecue sauce aside. Add beef broth to the inner pot of the Instant Pot and place the steamer rack (trivet) into the pot. In a small bowl combine the dry rub spices; sea salt, black pepper, smoked paprika, onion powder, garlic powder, cumin, and cayenne pepper. Stir to blend. Place the ribs in a large bowl. Add dry rub and toss to coat ribs in spice mixture. Stack the ribs on top of the steamer rack in the pot. Pour half of the barbecue sauce over the ribs and save the remaining half of the sauce for brushing on the ribs after cooking later. Close & lock the Instant Pot lid and flip the steam release handle to the Sealing position. Select Pressure Cook (Manual) on High Pressure and set the cooking time for 30 to 35 minutes. Once cook time is complete, let the pressure release Naturally ( press cancel and leave the pot alone for about 20 minutes or until the pin on the lid drops). Open the lid and carefully lift out the trivet & ribs. Transfer ribs to a serving plate and brush the ribs with the reserved bbq sauce and serve.